Calf health is paramount to your ranch’s profitability and reputation. Managing for a healthy calf starts in utero and continues throughout its life span. Nutrition of the cow and calf will have a direct impact on the subsequent health of the calf on the ranch and in the feedlot. 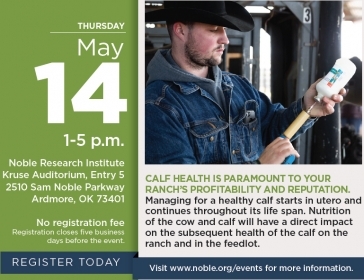 Join Noble Research Institute consultants and an invited veterinarian to learn the finer points of herd health management and about the national Beef Quality Assurance (BQA) program, which outlines proper vaccine and medicine storage and handling.